Stress can be a great thing. But when we experience too much of it, especially on a chronic basis, it can lead to serious problems in the short run and over the long haul. Let’s start with the basics and then explore how we can help children, youth – and ourselves – better manage life’s stressful times. The Stress Response: The earliest humans experienced stress when there was a threat to their safety. When the brain detects a threat – real or perceived – it sends signals to different parts of the body to help us deal with it. For example, the brain signals the body to release the hormone adrenaline. That sharpens our senses, quickens our breathing, dilates blood vessels, increases heart rate, and tenses our muscles. This is part of the “fight, flight or freeze” response that prepares us to act quickly when faced with danger. Today, not all the stress we feel has to do with real danger. Sometimes the stress response system kicks in when we are facing other sorts of challenges, such as talking to an angry friend, dealing with looming deadline or juggling too many tasks at once. 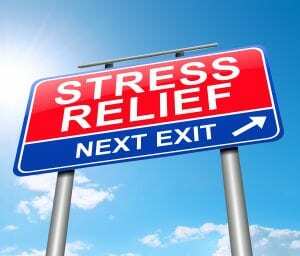 The Good Side of Stress: People often talk about stress as a negative thing, but everyone needs a certain amount of stress to feel energized, alert and engaged in life and its challenges. Stress becomes a problem when we experience too much of it for too long or when we can’t recover from stress. Our bodies and brains were not designed to be in stress mode all the time. When our stress systems get overworked, we are at increased risk for various health and mental health problems and have a hard time concentrating on matters at hand, including learning. Adversity in life is a normal – and in fact a good – thing. As Bruce Perry, a US based psychiatrist and leader in adolescent mental health, coined “Resiliency = stress + support”. Let’s unpack ‘support’ to get a better idea of how we can help young people (and ourselves) thrive, not just survive, in today’s world. Having others to lean on in good times and bad makes all the difference. When it comes to children and youth, access to caring, supportive adults can make stress more manageable. Learning to recognize and manage stress is an essential life skill. Stress affects us all. Invite students to think about what stresses them out and help them learn the difference between a stressor (what causes stress) and stress (the body’s response). What’s stress look like, how’s it feels, what do we do about it? Having a caring adult share their own experiences helps – so too does optimizing teachable moments that are typically stressful (e.g., immunizations, upcoming exams, busy workloads). The first step in developing a plan to manage stress is to ask this question – “Is the situation causing my stress something that I can avoid? Or do I have to learn to accept it and manage it?” If you answered avoid – then you already have your action plan. Avoid that source of stress as much as possible. Unfortunately, though, life often throws us stressors that we cannot avoid. Then we need to think about what aspects of the situation we have control over so we can take actions that will help us reduce the stressors or cope better with it. Most people need to use both types of strategies at various times. The infographic below provides a glance at the various psychologically sound strategies and can serve as a helpful reflection tool – for yourself and with students. 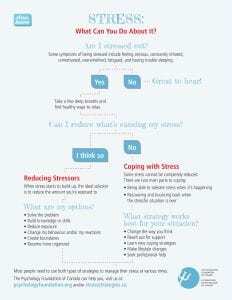 StressStrategies.ca – a web-based, self-help stress management tool for adults.